If the user clicked the Ok button, true would be returned by the confirm(msg) function. If the user selected Cancel, false would be returned. Returning false in OnClientClick will effectively cancel the rest of the event processing (i.e., the event handler for the OnClick event won't be triggered). 21 //what should we do when "Maybe" is clicked? 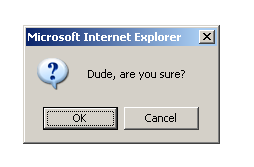 The event handler for the Yes button in the dialog are on lines 12-15. Line 14 is where we actually do the postback manually. 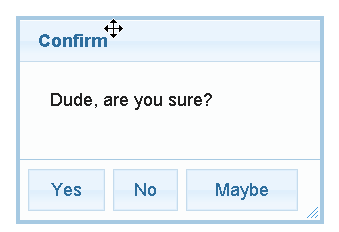 As you can see, it is quite easy to replace the standard confirm dialog and make it function in the same way. All that is needed is a little elbow grease :).